Our apps all have something in common: they help you get your work done, whether it’s signing a PDF, taking notes in class, building a business plan, or preparing a document for the print shop. All of our apps are pretty stodgy — except Spirality. We launched Spirality in the winter of 2016, after a haphazard 4-week development process. We made it for fun — the first version was free, with no upsells or ads. We just thought that Surface Pens were cool, and wanted to make something that used them. Our cold, mercenary app developer hearts grew three sizes. It was humbling to be told we were making pen computing more accessible, and that we were helping people who don’t see themselves as artists to be creative. Something else we learned: Spirality’s users don’t fit the profile of our other apps. In fact, they hardly fit a profile at all. 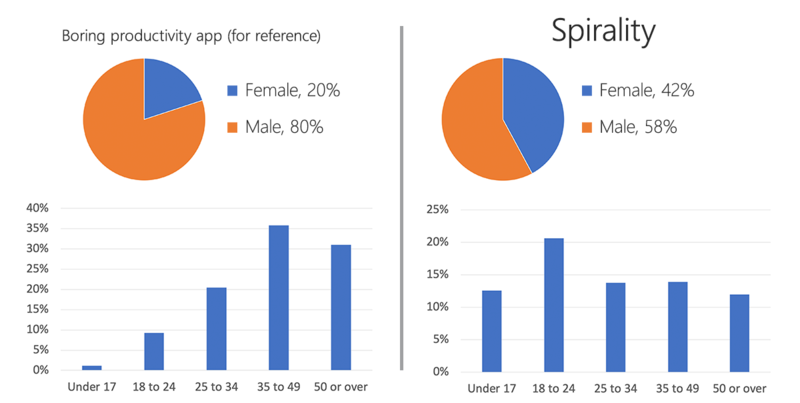 Spirality seems to be able to connect with people of all genders, ages, geographies, and abilities. Note: Microsoft accounts only allow users to specify ‘Male’, ‘Female’, or ‘Not specified’ for gender, and we don’t receive counts for ‘Not specified’. When we realized we were engaging a different type of user with Spirality, and enabling all sorts of people to have fun with computers in the same way we have fun with them, we decided Spirality deserved more. That’s why in December 2018, on Spirality’s two-year anniversary, we re-released it — rewritten from scratch, and now completely free. It was healthy for us to take a break from our bread-and-butter productivity apps and indulge with this fun app. It feels good to unlock something new for all those millions of users with touchscreens and pens. If you’re a fellow app developer, try stepping outside of your comfort zone . We did, and we don’t regret it. CEO & co-founder of User Camp. Windows Developer Award finalist Mateo Jurisic has joined User Camp.